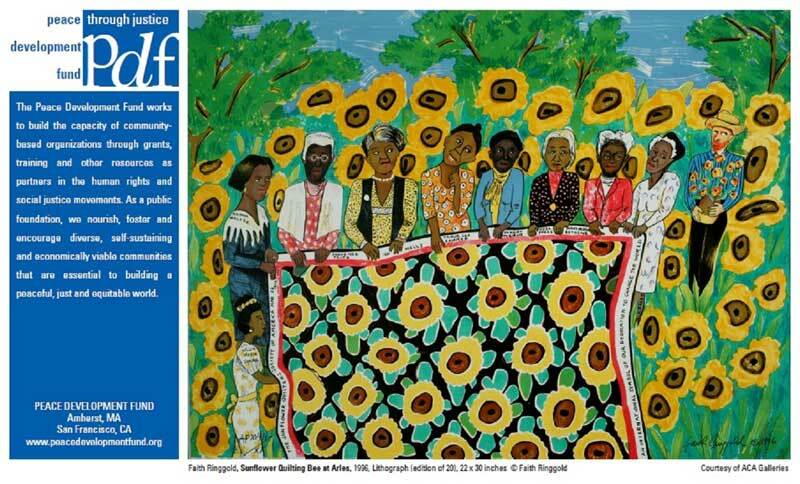 Ringgold’s artistry has taken many forms, from social realism, performance art, soft sculpture and children’s books to her famous Story Quilts. Several themes underlie her work. One is the desire to raise awareness of the cultural heroes and beauty within African American culture. Two, is the myth of a white male dominant society. And three, the issues confronting all women. She is the recipient of more than 75 awards and honors and her work is in the permanent collections of numerous museums in the United States and abroad including The Art Institute of Chicago, IL; The Baltimore Museum of Art, MD; The Boston Museum of Fine Art, MA; The High Museum, Atlanta, GA; The Metropolitan Museum of Art, NY; The Museum of Modern Art, NY; The National Museum of American Art, Washington, DC; The Philadelphia Museum of Art, PA; The Studio Museum in Harlem, NY and The Victoria and Albert Museum, London, England. The 1996 lithograph of this piece is flanked by PDF’s mission statement, and is courtesy of ACA Galleries in New York City. This special run of signed 20×14” posters is available for sale, $29.95 including postage and delivery in the U.S.
To order your poster, click on “Buy Now.” All proceeds benefit PDF grantmaking.